When Mick Swagger approached me, she was ready for a change of pace. 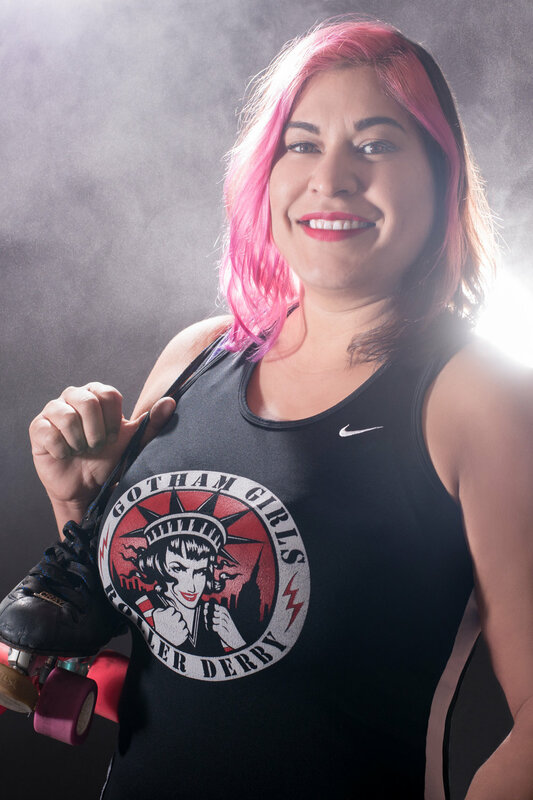 She had recently left her day job and wanted to take her side work as a roller derby coach to the next level. She had played the sport for nearly six years on top ranked teams and had several national championships under her belt and was ready to turn that knowledge into a full-time business that would allow her to travel the world. We decided what she needed most, was energetic portraits. Images she could use over and over again to promote bootcamps, send to her sponsors, and use on her website and social media. Mick was already known as a force on the track. We wanted her portraits to reveal her dynamic personality and showcase her sense of humor, which is a large part of her successful coaching style. I proposed that we highlight her fun, outgoing and legendary athletic personality by having her emerge from a glowing cloud of smoke.